Never leave home without you sidearm and the DeSantis Prowler™ Self-Locking holster. The unique Redi-lok™ system upgrades this holster to a level II self-locking holster for maximum safety. A finger activated trigger lock allows for seamless quick-draw action. 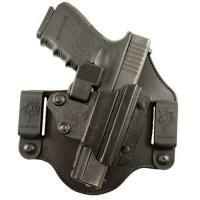 Designed for maximum versatility, this holster can be worn either as a tuckable in waistband (IWB) or over waistband (OWB) holster. The uniquely engineered Tuckable 360® C-Clip provides adjustable cant and height for full customization. With heavy-duty parts, yet lightweight design, be assured that this piece of tactical equipment will never disappoint, slow you down or hinder movement. Constructed from rugged Kydex® sheets and quality parts, the Prowler™ is built to last. Nice outfit, I wear it IWB, nice to be able to do so and have added protection like that of my OWB Serpa holster. What width belt is recommended? Fits belt width up to 1.75"